So you will need to set up a social enterprise legally. What do you need to know? It is important to ensure that you choose an appropriate structure for your social enterprise. Your social enterprise is fundamentally a company under law. No matter which type you choose you will be set up as a company. But which company is right for you? Raising finance – how does the enterprise plan to raise money? Be careful to consider should the various options to ensure that you choose the legal structure that most suits your social enterprise in terms of management style and mission. Social ownership – ensuring that the community and stakeholder interest is reflected in the control and ownership of the enterprise. The income streams and activities of the enterprise – what proportion of income will be generated from donations, grants, fundraising, contracts, goods and service provision and other trading activities. Regulations and reporting – some legal structures have a lot of regulation and may have limiting rules. Some may require a lot of annual reports to be completed that may be a problem for smaller enterprises. An unincorporated group has no legal status and is made up of a group of people with a shared interest. This type of group is best when there is an informal mission and the organisation tends to deal with small amounts of money and does not require a huge amount of input or work from members. A sole proprietorship is the simplest and most common structure chosen to start a business. It is an unincorporated business owned and run by one individual with no distinction between the business and you, the owner. You are entitled to all profits and are responsible for all your business’ debts, losses and liabilities. A sole trader would not be considered to be a social enterprise model alone but it is the simplest way to set up a company on your own. A partnership is a type of unincorporated business organisation in which multiple individuals, called partners, manage the business and are equally liable for its debts; other individuals called limited partners may invest but not be directly involved in management and are liable only to the extent of their investments. 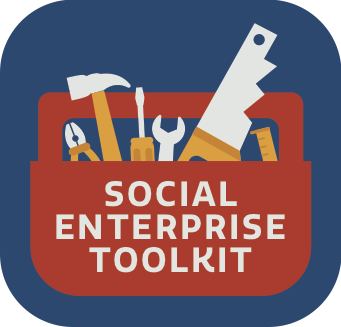 This form is not considered to be a social enterprise structure either. A Private Company Limited by Shares (LTD) is a model form of a private limited company created under the Companies Act 2014. This is the most common form of a Limited Liability Company in Ireland. LTD companies remains by far the most frequently incorporated entity for private, commercial businesses and ventures in Ireland. This is a company limited by shares, a company having the liability of its members limited by its Constitution (previously referred to as Memorandum & Articles of Association) to the amount, if any, unpaid on the shares respectively held by them. A company that has shares means that the company is essentially owned by the shareholders. Those shareholders elect Directors who act on behalf of the company and manage the governance of the organisation. There are some charities in Ireland that run companies limited by shares and become the sole owners. Social enterprises could be companies limited by shares, however, the most common form is a company limited by guarantee as we will see below. For charities, community and voluntary groups wishing to incorporate, the most commonly used structure is as a Company Limited by Guarantee (CLG). It is arguably the most common type of company for a social enterprise. A company Limited by Guarantee has many of the same features as a Company Limited by Shares. Both offer limited liability for directors. However, a CLG now has shareholders. The assets of the company are therefore held in trust by the directors. Industrial and Provident Societies or Mutuals are essentially ‘cooperatives’. These are organisations that are owned by the members of the cooperative for the benefit of the members. The Act which brought the legal form into law in 1893, provides for a society to be registered to engage in any industry, business or trade authorised by its rules. Registration under the Act renders a society a body corporate with limited liability. The biggest and best-known are in the agriculture and food areas in Ireland. Credit Unions are also set up in this type of legal form. However, the legislation is poorly updated in Ireland and is more difficult to set up than other forms. It is definitely worthwhile seeking advice if choosing this form. If you operate in the Republic of Ireland, have a charitable purpose only and provide public benefit then you are a charity. The Charities Act 2009 requires all charities to register with the Charities Regulator. A charitable purpose must be of public benefit, which means that it must be beneficial in an identifiable way to the general public or a section of the public. A Registered Charity Number (RCN) is a number assigned to charities by the Charities Regulator once charitable status has been awarded. In Ireland, there is a separate status for charities that comes from the Revenue Commissioners. This separate number, called a CHY number, grants the charity certain exemptions when dealing with the Revenue Commissioners. Social Enterprises can be charities and in fact in Ireland, they often are. However, it is not necessary for social enterprises to have charitable status and it is important to reflect on whether the charitable status is relevant to your social enterprise. Asset lock: No-one technically owns a charity. It is held in trust by the directors for a duration, but no-one has shareholding or ownership of the organisation. This means that it can’t be sold for personal profit. This principle is called an asset lock. For example, if a charity gets donated a building, that building will be kept in the organisation. The asset lock prevents the directors from selling it for personal profit. Directors and pay: Directors of charities cannot be paid for their work. In a private company such as a Company Limited by Shares, directors can get paid for their duties. In a charity, only employees can be paid. Employees cannot be directors: Employees of a charity cannot be directors of that same charity. Directors will be separate from the employees however, it is possible for employees such as the CEO to be in attendance at board meetings. While many social enterprise in Ireland are trading charities, in many cases, they do not necessarily need to be. How much will each legal entity cost? What finance do I need? Who will be a director? Who will be CEO? Is there any requirement from potential funders to be set up a particular way? If you need help in selecting a structure, it is best to seek assistance from an accountant or solicitor. Chatting to a professional can greatly reduce the chance of error and can help you in getting your social enterprise started on the right foot from day one. You can also seek advice from your Local Enterprise Office or through any of the Local Development Companies that may be able to offer support and advice.